In a first, several components of the Orion spacecraft project were combined for a vibrations test. Test subjects, modified advanced crew escape suits and the most current seat design for the crew impact attenuation system underwent simultaneous testing so the human factors engineers can begin understanding how the Space Launch System may affect astronaut performance. 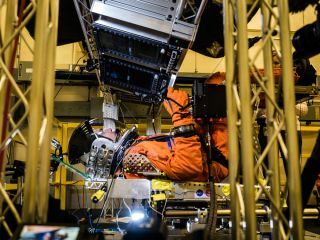 Launch conditions are never easy so engineers at NASA's Johnson Space Center in Houston have already begun simulations of the first crewed launch of the Orion spacecraft on the agency's new megarocket, the Space Launch System (SLS). "This was the first time this key hardware was brought together to evaluate how launch vibrations may impact the astronaut's ability to view the displays and controls," NASA officials wrote in an image description. "While Orion's late 2018 mission will be uncrewed, engineers are hard at work performing all the necessary evaluations to make sure the spacecraft is ready for crewed missions beginning as early as 2021." The Space Launch System is NASA's new launch vehicle designed to launch crews of up to four astronauts on deep-space missions. The system offers more payload mass and volume in addition to an evolvable configuration for future deep-space missions.